We are again getting to the time of the year when the days are getting shorter and the nights colder. Many of us are turning our heating on, without having to think too much about it. However, many others are in a situation where they cannot afford heating in their homes and this time of year can have dire consequences on their health and wellbeing. We at the Centre on Innovation and Energy Demand, together with South East London Community Energy, a community group developing sustainable energy projects, have been researching community-led initiatives that address fuel poverty. An estimated 2.35 million households in England alone live in fuel poverty whereby they need to use more than 10-15% of their income to heat their homes and use other key energy services such as cooking and washing clothes. Fuel poverty is usually attributed to three key factors: the level of household income, the quality of housing in terms of energy efficiency and the cost of energy bills. Even though the UK does not have the highest gas and electricity prices in Europe, our housing stock is one of the poorest regarding energy efficiency. For example, many houses have bad quality insulation – or none at all – and lack purposeful heating arrangements. This also has implications on climate change. The UK’s 27 million existing homes account for around 25% of our greenhouse gas emissions. Fuel poverty is a complex issue as those living in fuel poverty are not always easy to identify, and there can be a stigma attached to being fuel poor, preventing people from seeking help. Fuel poverty does not just mean being cold in your home, but the associated problems of cold and damp homes can also have severe health implications. The fuel poverty charity National Energy Action has estimated that fuel poverty is costing the NHS around £1.36 billion a year, as those who live in fuel poverty are more likely to need additional doctor’s appointments for issues such as respiratory diseases and mental health including anxiety and depression. Already vulnerable groups such as the elderly, children and the disabled can be especially affected by the consequences of fuel poverty. Furthermore, some of these consequences can be fatal. Each winter people die of illnesses related to fuel poverty, for instance during 2014-2015, England and Wales had the highest number of ‘excess winter deaths’, with 43,900 people dying – 27% more than during the non-winter months. Numerous government programmes have addressed fuel poverty over the years, including programmes such as the Warm Front which ran from 2000-2013, subsidies such as the Warm Homes Discount, an annual payment of £140 towards energy bills, and the Winter Fuel Payment aimed at pensioners. Energy supplier obligations such as the Energy Companies Obligation (ECO) have targeted energy efficiency measures to vulnerable customers. However, energy utilities might not be best placed to deal with fuel poverty, especially given all the other social and health issues linked to the problem. Despite government pledges to eradicate fuel poverty, the problem persists. One effective solution would be to upgrade the UK’s poor quality housing stock, but with limited policy support, that is unlikely to happen anytime soon. While government support for addressing fuel poverty has not eradicated the problem, an increasing number of community groups have started to address the issue. 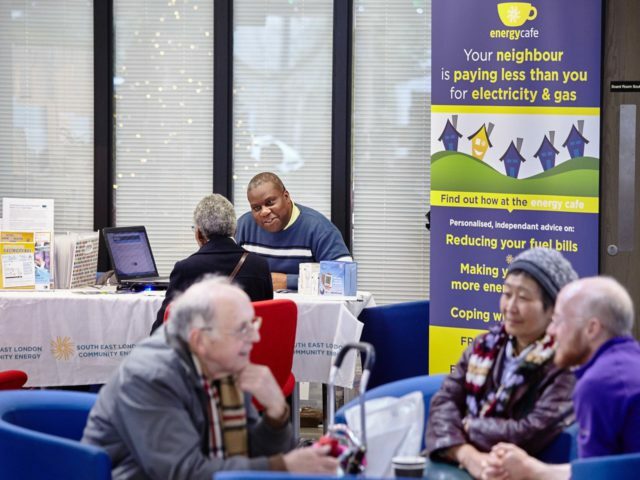 Our research, funded by the Chesshire Lehmann Fund, focused on ‘energy cafés’, an energy advice service run by community groups to help those living in fuel poverty. A number of community energy groups across the UK have hosted energy cafés or energy shops, which have been held in a number of locations such as high street shops, farmers markets and community cafés. Some of these energy cafés are permanent, whilst the majority operate for a short period of time in a pop-up shop style. Our research findings indicate that energy cafés could provide a key service in identifying those people that may need help also beyond their energy bills. In other words, energy cafés could act as a triage service bringing together local authorities, health workers and community organisations. Many of this work relies on limited funding via grants and volunteer time, both of which can be in short supply, but are often inspired by genuine desire to help those in need. Fuel poverty kills and it is an urgent issue that needs to be addressed as an energy, social and health issue, and at all levels of government, local authorities and health authorities. It also has wider energy justice implications in terms of how we consider equity within our energy system. We need to ask ourselves what type of a society we live in – and if our homes, usually a source of comfort, are allowed to keep having fatal consequences. This post was originally published on the Finnish Institute in London blog. Photo Credit: Jaime Pérez ‘cold’. All Creative Commons.